Pricing appears to be based upon the sector length, with a new purchase required for each sector. Due to the nature of the satellite system, high latency is to be expected when using the system. Here's the list of specific UA planes that have wifi. And here's the overview from united.com. 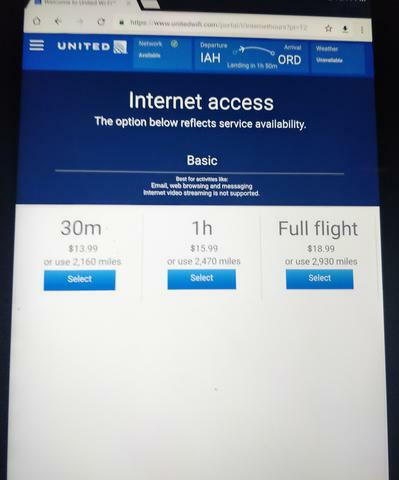 Do any UA flight, particularly international ones, have Go Go access?. $30.99 for EWR-HKG Dec 27th. I realize it's a 16 hour flight, but couldn't there be a reasonable cap on this charge? There may be the occasional person who works the entire time, but I would guess the average usage must be considerably less (assuming most people want to get some sleep). A comparable hotel basic WiFi charge (which, like this one, doesn't support streaming) is around $8.00 at most for 24 hours ($0 for certain elite members). I would think a 4 hour mid-con flight with a high percentage of business travelers would tax UA's WiFi network much more than this flight. I get free GoGo wifi through T Mobile One Plus account. Of course it's not so great if you want to use the tablet though. As I learned on Dec 20 from GoGo support (while in the air), despite UX using GoGo, United does not participate in the free GoGo bundled with the T Mobile One Plus. Well I just flew Ua917, sfo to akl. it was offered for 21.99 for whole flint. seems to be a good price compared to other routes but I slept. I guess on the basis of length of flight your 21.99 SFO-AKL was a better deal than my offer of 19.99 DEN-ORD tonight Seriously, I have no idea what United is thinking here. Maybe they figure most people will sleep since it departed SFO around 11 PM. So they had to sweeten the offer to get you to buy. IME, there's always at minimum a 3 hour outage over the south pacific, and it's about 50/50 as to whether it works at all to SYD, but maybe I'm just cursed. Whats up with the sudden jump in WiFi prices? Did something change over the last few days? Anyone else notice a drastic increase in the pricing? It might be United's retaliation against a certain T-Shirt. chavala, Dublin_rfk, bman1002 and 1 others like this. If you see the shirt on a UA flight and you want to rder it right away you need Internet access! 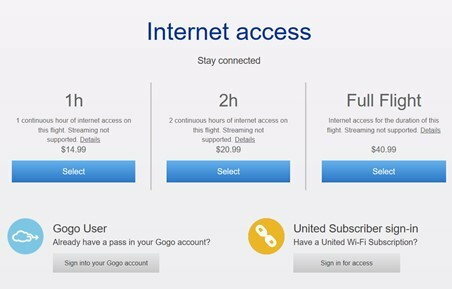 Is it me getting lucky with WiFi or is this some sort of plan by United? I flew end of Dec and just today domestically. I usually just leave my device in airplane mode, but in both instances I decided to check the flight progress through the United app. Both times, I flipped on WiFi, connected, and wow notifications came in left and right. To confirm my suspicions I would check out other websites which seemed to work just fine. Most expensive wifi I've seen for full flight so far. EWR-LAX $40.99. Luckily I had gogo coupon to redeem.